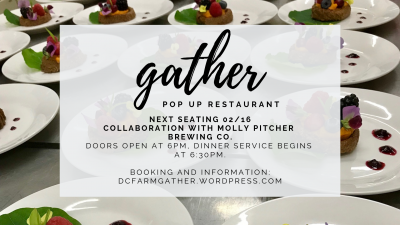 GATHER Pop-Up Restaurant is excited to offer a collaborative venture with the talented chefs at Molly Pitcher Brewing! The February GATHER will be designed around a pairing menu featuring MPB brews and locally-sourced ingredients. February 22nd, Stern Great Room. Doors open at 6 p.m. with dinner service beginning promptly at 6:30 p.m.
Dinner guests must be 21 years or older.